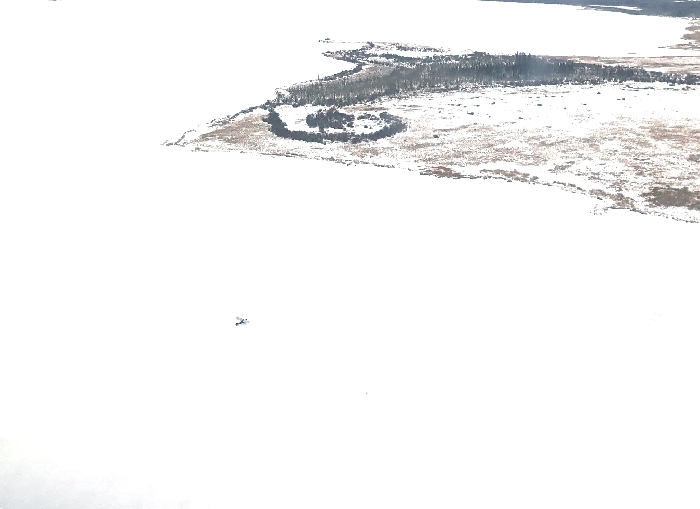 On January 13, 2019, at approximately 6:45 pm, RCMP were notified of an overdue pilot. A 71-year-old male from Ashern, Manitoba had left that morning to fly his plane to a camp at Sisib Lake, which is south of Grand Rapids. The pilot never arrived at his destination. RCMP contacted the Joint Rescue Coordination Centre in Trenton, Ontario, which then deployed a Hercules search plane to the area. In the early morning hours of January 14, searchers aboard the Hercules located a small fire on Pickerel Lake, west of Sisib Lake. At that time, Canadian Armed Forces Search and Rescue Technicians (SAR Techs) were unable to parachute to the site due to poor weather conditions. It was requested that the RCMP conduct a snowmobile patrol to investigate the fire and locate the pilot. Grand Rapids RCMP, the Canadian Rangers, and Manitoba Sustainable Development deployed as requested and travelled approximately 45 kilometers by snowmobile to the fire. While en route, the weather cleared and two SAR Techs ‎parachuted to Pickerel Lake just after 6:30 am. They located the pilot, who was in good spirits but suffering from dehydration. The SAR Techs provided medical treatment, and the pilot recovered on site. The pilot advised he landed safely on Pickerel Lake but when he tried to start his plane to leave he encountered mechanical issues which left him stranded. The RCMP, Canadian Rangers, and Manitoba Sustainable Development arrived at the site at approximately 2:30 pm and assisted the SAR Techs. At approximately 4:30 pm, the SAR Techs and the pilot were picked up by helicopter.